Richard Hays, MBBS, PhD, Dip RCOG, Dip RACOG, FRACGP, FACTM, FACRRM, is Professor of Medical Education and Dean of Medicine at the University of Tasmania and has been head of school or Dean at four Universities. Richard Hays was a rural medical generalist in northern Queensland before becoming a teacher and education researcher, gaining further qualifications in educational psychology and medical education. He has had roles in the development of several medical education programs, including new medical schools in Australia (JCU), the United Kingdom (Keele), Ireland (Limerick), Canada (Northern Ontario and Northern British Columbia) and in South-East Asia. He has published about 100 research papers, 150 other journal articles, as well as numerous book chapters and books. He still remains in part-time clinical practice. Richard began and completed medical training with the intention of becoming a rural doctor. He provided a form of procedural rural medical practice including rural general practice and hospital-based secondary care, mostly in Obstetrics. His move to academic life came after reflection on how medical graduates become and remain competent clinicians, and since then he has been involved in the development, implementation and evaluation of innovative models of rural health education and service delivery. Papercover, 214 pages, 180 mm x 250 mm. Practising Rural Medicine in Australia was written to inspire and encourage medical students, rural GP registrars and experienced rural doctors to think about the discipline of rural medicine. Whilst the practice of rural medicine can be rewarding and enjoyable, it poses both professional and personal challenges to doctors and their families. This book aims to help its readers survive and perhaps even thrive on these challenges. Underlying the book is the belief that rural medical issues are best understood through the interpretation of experiences in rural practice. Consequently, the book combines frank personal reflections based upon author's career in rural medicine with a series of self-contained, academic essays on some of the key themes current in today's discipline of rural medicine. Beginning with case scenarios that raise current issues, the book is arranged in sequence, from training for rural practice, through to leaving rural practice, although each chapter stands alone. It covers issues such as the adequacy of rural medical training and professional support, becoming a part of a rural community, the social and professional relationships in rural communities, isolation, rural medical emergencies, the occasional sense of 'failure', the sustaining good experiences, a colleague's addiction and incompetence, and returning to urban practice after rural practice. Every person involved in rural practice, at whatever stage of their career, will enjoy this positive thought-provoking book. 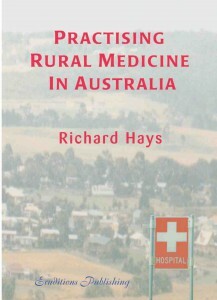 The book assumes that rural medical issues are best understood through the interpretation of rural medical experience. This unique text combines frank personal reflections and self-contained academic essays on current issues. Begins with case scenarios to raise key issues. Sequential presentation from training for rural practice, through to leaving rural practice.